Arms Race is a microgame found in the Dance Club Rub stage in WarioWare: Touched! It returns in WarioWare Gold as one of Young Cricket and Master Mantis' microgames. The objective of the game is to use the stylus to pull up the guy to help him to do the chin-ups. 1st level difficulty: The man must do three chin-ups. 2nd level difficulty: The man must do four chin-ups. 3rd level difficulty: The man must do six chin-ups. 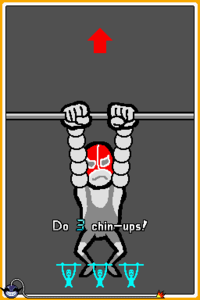 1st level difficulty: The man must do two chin-ups. 2nd level difficulty: The man must do three chin-ups. 3rd level difficulty: The man must do four chin-ups. The characters seen in all 3 levels are the same ones that appear in the third level of Instant Replay from WarioWare: Twisted!. This page was last edited on February 14, 2019, at 20:09.